A pinch and a punch...for the first of the month. And it's the first day of NaBloPoMo; "November... is the month in which you post something to your blog every day, in accordance with the National Blog Posting Month challenge!" Without Fear or Favour I am going to attempt to change my erratic blog style to regular structured daily entries for 30 days. Topics will probably be about Knitting, Lighting, the Blue Mountains Flora and Fauna and a bit of New Zealand, because this is the blog of a Knitting Lighting Technician from New Zealand who lives in the Blue Mountains of Australia. No surprises there. 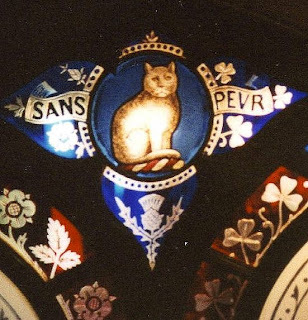 This stained glass Cat that can't purr is from the staircase of New Zealand's only castle. 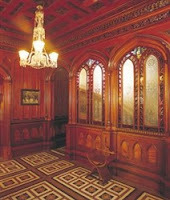 Located on the Otago Peninsula Larnach Castle was built in 1871 by the Australian born William Larnach, Merchant Baron and Politician, and both building and owner had a colourful and tragic history. The family motto was Sans Peur - without fear - someone obviously had a sense of humour. The castle is now a major tourist attraction for Dunedin but I remember it from my childhood as a dilapidated and run down building with sheep grazing in the grounds. It's great to see it fully restored to its extravagant glory and to see that little idiosyncratic features like this little purrless cat survived the years of neglect. What a charming little cat in the window. I'll look forward to reading your posts every day, in your new structured approach. I didn't know that November was NaBloPoMo! I'd better get cracking! Sans Peur is actually the motto of the Sutherland Clan. So Mr Larnach probably had some Sutherland in the family. Yep, that's a modified crest of the Clan Sutherland. I've mainly seen it with the cat poised rampant.